Ted Brown Music in Yakima has four full time in-house repair technicians that are ready to service all of your instrument repair needs. Whether you just need a simple adjustment or a complete rebuild, our technicians are fully equipped to handle whatever ailments your instrument may have. We are also the warranty service location for all the band and orchestra instruments we sell, and will coordinate any warranty work on everything else. If your instrument isn’t working like it used to, let us know and we’ll get it playing like it should. Mark Felix is the full time repair technician at Ted Brown Music in Yakima. He specializes in brass, woodwind and stringed instrument repair. 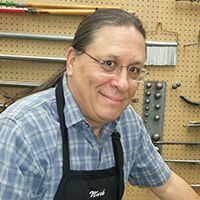 Mark completed the band instrument repair course at Fred Kirschner’s Eastern School of Musical Instrument Repair in 1981 and has been providing quality service on brass and woodwind instruments for over 30 years. 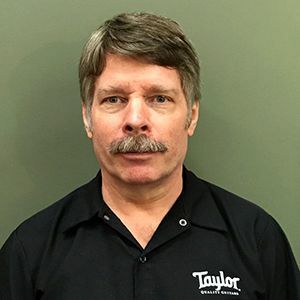 He knows and understands all aspects of instrument repair, from exact pad seating, key fitting, and adjustments on all woodwind instruments, fine tolerance brass instrument valve work, and small dents, right up to complete overhauls and custom repair work. Mark does all his work with a pride of craftsmanship you thought impossible to find today. 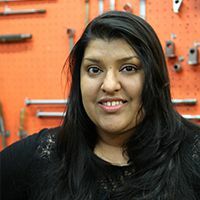 Mercedes Evans is our newest full time technician specializing in brass and woodwind repairs. She is a graduate of Renton Technical College with a certificate in Band Instrument Repair Technology. Mercedes apprenticed for two years in the central valley of California before joining Ted Brown Music. Mercedes has studied Music at Modesto Junior College and preformed with various community ensembles. She teaches private woodwind lessons and volunteers her repair skills at local band festivals and school performances. Dustin moved to the Yakima Valley in the summer of 2015 from St. Louis, Missouri. He has a degree in Jazz Performance from Southern Illinois University of Edwardsville. He has performed with many musicians from the STL area playing all types of music. He’s now both a regular upright bass player around the Northwest as well as the bass and cello teacher at Ted Brown Music in Yakima. Dustin has years of experience in woodworking and repair. 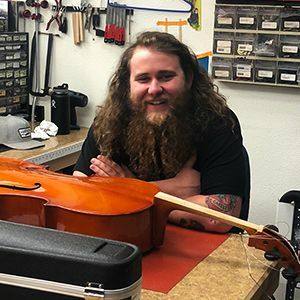 Upon moving to the Pacific North West he began apprenticing under Josh Hegg at Ted Brown Music in Tacoma to refine his skills with instrument repair.